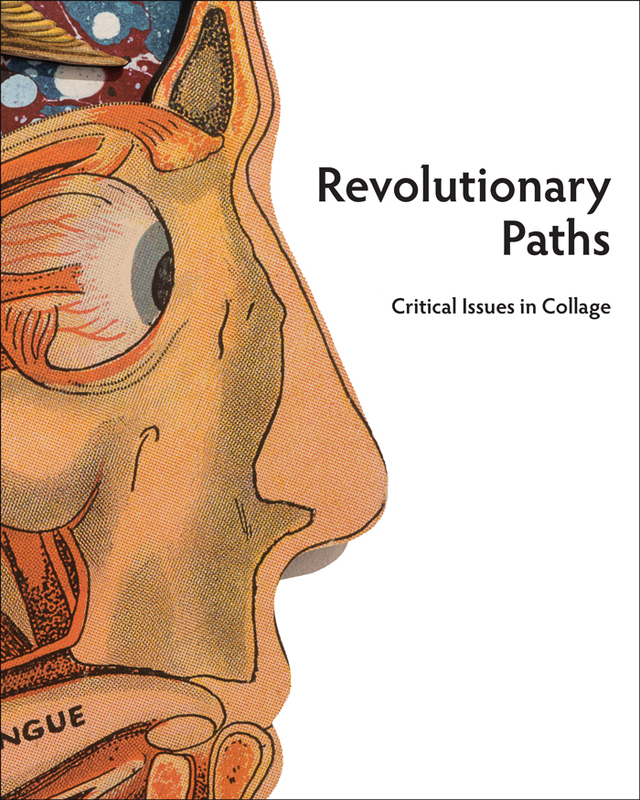 On the release of the catalogue “Revolutionary Paths: Critical Issues in Collage”, I wanted to share some thoughts about why I wanted to curate this exhibition and why I hope this catalogue is useful. Back in October 2016, my editorial in Kolaj #17 took issue with a 288-page coffee table book about collage. I called it stupid and wrote, “It has no critical value and contributes little to understanding the medium. And therein lies the problem when collage crosses the minds of editors and exhibition programmers. ‘Let’s have a show about collage’ is as brilliant a curatorial statement as ‘let’s show some paintings’ and yet, nothing seems to stop a parade of exhibitions titled ‘Cut and Paste’ from crossing our desks.” Fast forward a year and Antenna Gallery invited me to curate an exhibition of collage, I decided it was time to put up or shut up. The concept for the exhibition was a little meta: show a dozen or so collage works all of which represented a point of departure for further curatorial inquiry. To build the show, I relied on people we had profiled in the magazine, artists from the Kolaj Magazine Artist Directory, and responses to our call to artists for Kolaj Fest New Orleans. My hope was that by showing the elasticity and diversity of collage, we could inspire others to give the medium its curatorial and critical due. Why is that so important? Group shows or collaborative, hashtag projects online are part of the fabric of the collage community. It’s how we come together and how we share ideas and our work with each other. And there is nothing wrong with that. In fact, I would argue that our proclivity for community makes us better artists. But the reality of the world is that being good at collage is only half the game of being an artist. The vocation of art is a burden that most of us just have to do. Something from within compels us. At the same time, we are complete human beings trying to make our way in society. That means we have bills to pay, student loan debt, kids to raise, mortgages. And that means we need to reconcile this need to make art with the social, political, and economic reality of a society that doesn’t always value what we do and doesn’t make it easy. Too often the system throws up roadblocks that are more about class, race, and gender than they are about meritorious and meaningful artwork. And while I believe we can always work harder and work smarter, nothing pisses me off more than seeing smart, talented art go unnoticed. Sometimes it’s you who needs to change, sometimes it’s the system. When it comes to the issue of how collage is talked about and presented in the art world, it’s the system. “Revolutionary Paths: Critical Issues in Collage” was on view at Antenna Gallery in New Orleans, Louisiana, July 11th to August 5th, 2018. D. Eric Bookhardt, writing in The Gambit called the show “pure poetry.” Decide for yourself. The catalog includes installation views as well as commentary from the exhibition. Paul Dean’s dystopian landscapes to Allan Bealy’s exploded collage boxes to Alex Hood’s digital work to Nathan Stromberg’s use of collage as paint, the catalog documents familiar collage terrain. 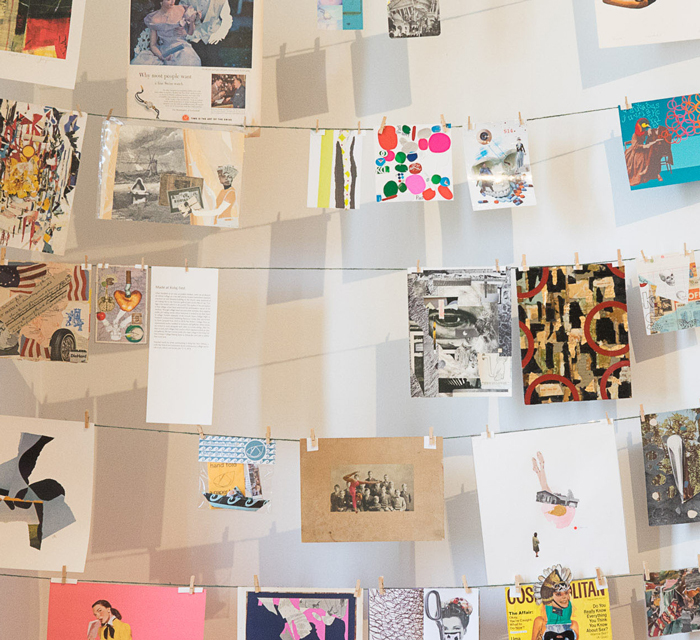 Jill Stoll’s mail art, Zach Collins’ collaborative work, and an installation of collage made at Kolaj Fest shows the communal and communicative nature of the medium. Collages by Michael Pajon and Morgan Jesse Lappin show how the medium isn’t always small and intimate. Nonney Oddlokken’s large, thread-and-paper work illustrates how the medium isn’t bound to glue. 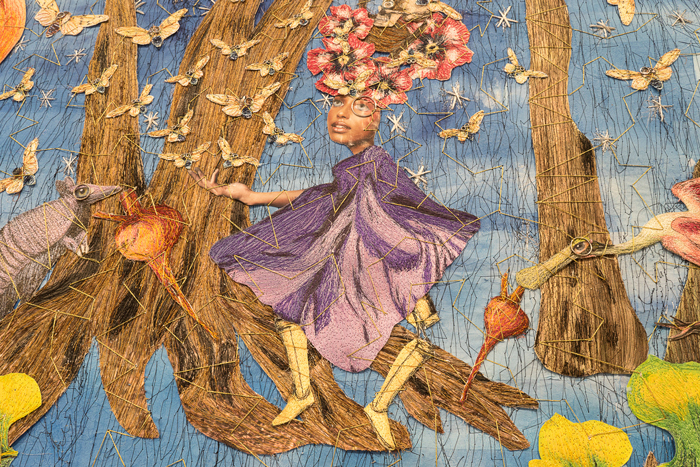 Evelyn Davis-Walker’s installation pieces, J. Marcus Weekley’s quilts, and Stephen Schaub’s in-camera collage photography challenge reductionist notions of the medium. Jeff Musser’s painting and Matt Zorn’s ceramics show the influence of collage on decidedly other mediums. These are all talented artists doing fantastic work. And they are not alone. Each of them is meant to be a kick-off point to go deeper. Each of them could be an exhibition in and of themselves, with many others joining to demonstrate how powerful this thing we call collage can be. And that is where you come in. To change the system, we need more people who understand collage out in the world curating. If you’re reading this, that means you. Don’t settle for simple presentations of your work. Or even better, pull together shows with a strong curatorial premise that document how collage functions, creates new thinking, mixes materials, and challenges the canon of art history. The main exhibition at Kolaj Fest New Orleans 2019 will continue the work of identifying points of curatorial inquiry. One symposium session will be dedicated to curating collage. And another session will raise questions about whether or not the exhibition, as we understand it, is the only or best format for putting collage out in the world. At the heart of all of these activities is this question: How do we change the system so that the art we make can do what it needs to do in the world? “Revolutionary Paths: Critical Issues in Collage”, installation view. (36″x72″; stitched handmade paper overlay, stitched imagery, 350 yards of hand-stitched gold metallic thread embellishments; 2018). Courtesy of the artist. (48″x36″; medium density fibreboard and archival inkjet; Edition of 4; 2018). Assorted works by artists participating in Kolaj Fest New Orleans 2018.